I only use traditional materials in the roof. I do not use stainless steel or wire ties or rods, plastic string etc. This is important if your roof is of scheduled / listed status. It is also important for the health of the roof. A good part of my work is for community groups, NGOs and the like, wishing to use a thatching project to engage and skill the public in revitialising a building or creating a new outdoor, covered workspace. See the video. 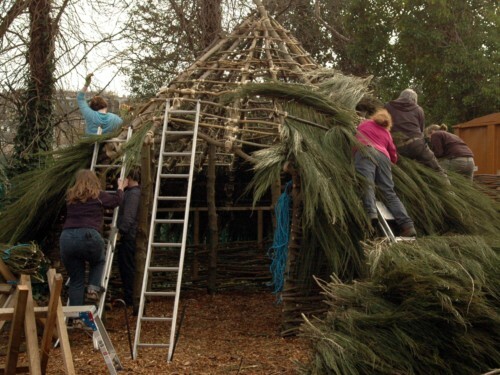 A video about a community garden thatching project (a Celtic round house). I work all over Scotland with a team of three thatchers, myself (Scot AnSgeulaiche), Toad and Weaver. I trained with the late Jim Souness, who trained with Duncan Matheson (Duncan Stalker) and Gaelic-speaking thatchers from Tiree. In keeping with the Highland tradition, we're not "Master Thatchers" the way the trade has in England. The Highlands didna really have such, historically speaking. Houses were maintained communally, by rotation within the townships. 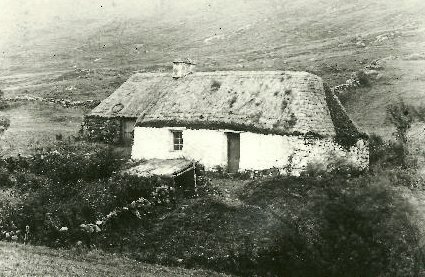 Today we have about six professional thatchers in Scotland (although a very small number of owners still maintain their own thatch, as we used to do). 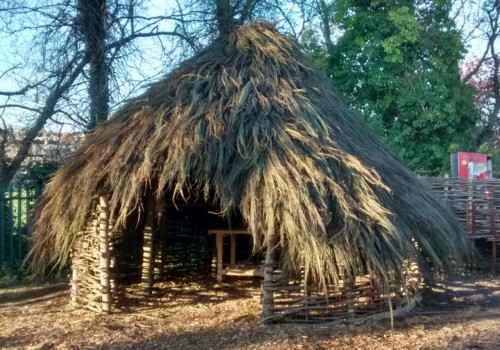 Most, but not all, of the modern, roving professional thatchers in Scotland use the indigenous styles of the Highlands and Islands and materials local to site. 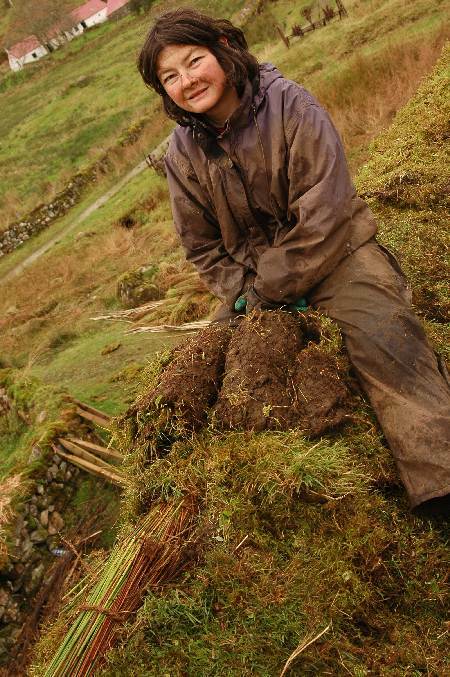 This is quite different to the style of our English and Lowland cousins who predominatly use one style and one material (Long Reed), usually importing it from abroad nowadays. 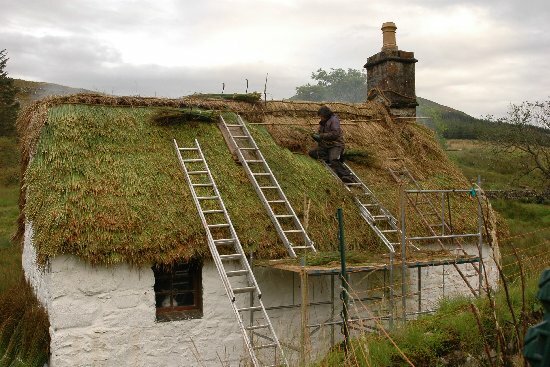 We think it's important to rethatch a Scottish roof in the local or original style, applying the 500 Yard Rule: if you can't find the materials fairly close to the site then you're moving out of the local style and into higher costs and other vernacular styles. It's not always possible to stick to the 500 yard rule, but it's a good start point. You'll want to ask about and consider this when looking for a thatcher. What does thatching a roof cost? As a rough estimate, it's between about £60 and £140 per square meter for a dressing thatch, which revitalizes the roof, keeping the existing thatch underneath. A complete rethatch would cost perhaps 60% more. There is a huge amount of variability dependent on materials choice and availability locally, as well of course as the condition of the existing thatch and roof timbers. 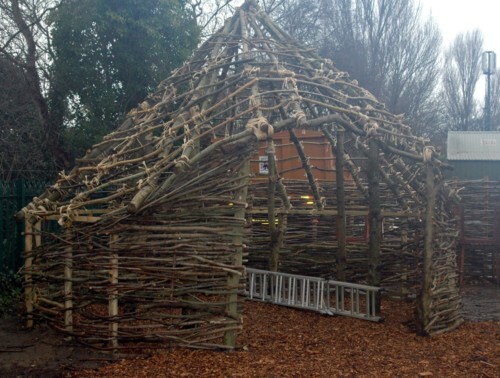 It should be noted that thatch is put onto a roof structure that has been designed for thatch. It cannot successfully be added to a roof intended for slate, tin, tile etc. If you are wanting a thatch newbuild, talk to me about the roof structure first. Note also that thatch is not the cheap alternative when roofing a house. 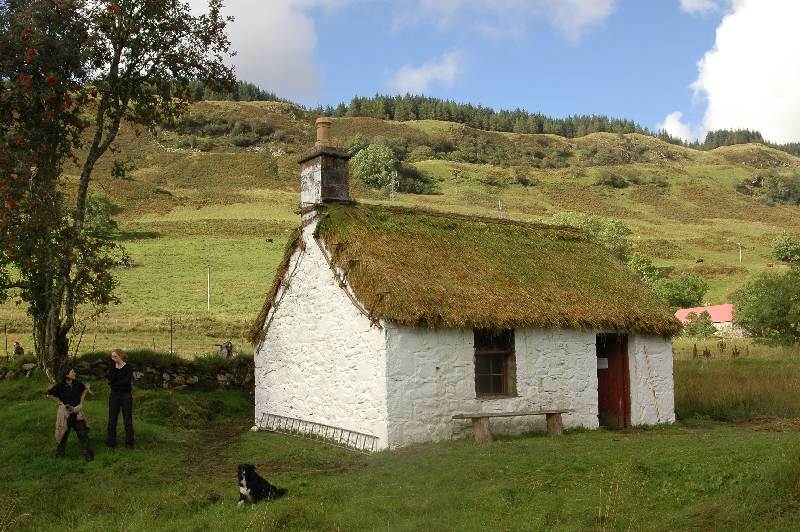 There is a reason that there are few thatched properties left in Scotland (about 80): despite the large upfront cost, slate and tin are cheaper in the long run. Owners want a thatched roof not for its cost effectiveness but for its beauty, tradition and environmental credentials. How long does a thatch last? If it is maintained correctly (serviced like a car each year, minor and major) then a thatch job will last between 2 and 20 years, depending on material type, maintenance and location. At the end of that time, the above "dressing thatch" /"ath-tughadh" would be needed. I am keen to train roof owners to do the yearly maintenance for themselves. Do we have references or examples of work? 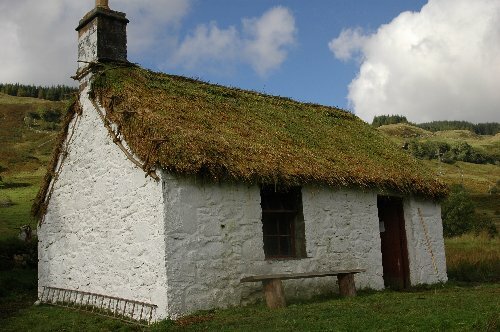 Given that we have been maintaining one particular historically-significant roof for a number of years, we can direct you to view our work on Bell Poll's House at the Auchindrain Township Museum. As a week-long paid for course (£500), living on site and working on a job of my choosing (you need your own clothing, transport to the site, food and camping-style accommodation gear. Full details upon application.) These happen only once or twice a year. The course is also suitable for building owners, indeed, the on-the-job training might be on your own property. As an apprentice (non-certified) where your training fee (£500) is refunded after three thatch projects with me. During the three projects you are paid a trainee rate of pay which equates to subsistence. If you care for, or are considering buying, a thatched property in the Highlands or Islands, you'll want to know more about the indigenous thatch styles. 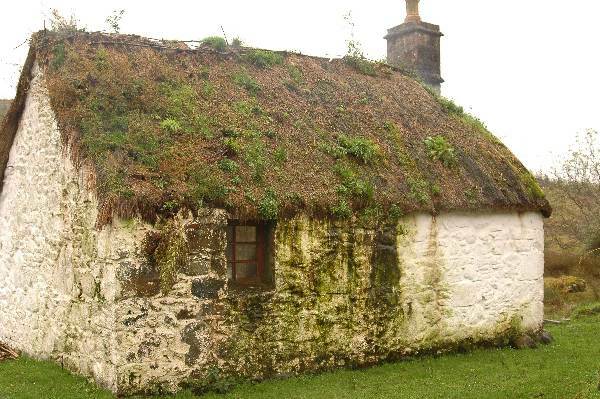 If you are applying for a HES grant to rethatch, then understanding the difference between Highland and Lowland / English thatch might be important. I can advise on materials, what to consider in terms of the roof timbers, the location, the local style and the current state of the property. If you just need some initial outline help, a first phone call will cost you nothing! If you need a more worked up proposal, start with that free phone call or email and we'll cost it from there. Site created 2016. All images copyright.